Graffiti I focused on bookstore "this is mine" stamps. Here we'll look at graffiti of a more personal nature on two Wm. 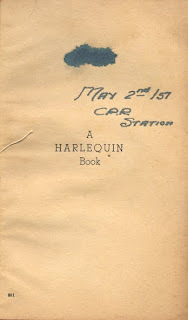 Collins Sons & Co. Canada Ltd and one Harlequin Books publications. 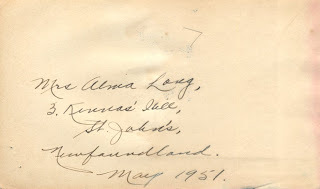 The last one is of personal interest as the writing is my father's. The car he wanted "to get more from" was a 1949 Studebaker. The "CPR" is the Canadian Pacific Railroad's station in Sudbury, Ontario. In a previous post I showed the stamp for Wolfe's Bookstore on an old Harlequin Books paperback. 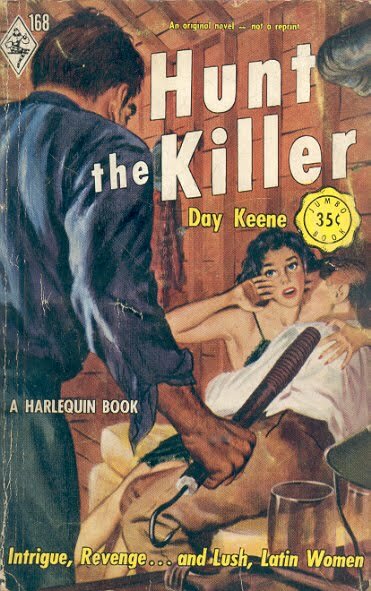 There is a group of five books published by Harlequin Books in 1952 and 1953 that state "An original title - not a reprint" on the cover. With the exception of a couple of later books Harlequin did not advertise its few paperback originals. These appear to be exceptions to the rule - or are they? 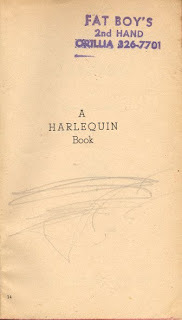 The Harlequins are all copyright Harlequin and don't mention Hanro but, given the dates on the Hanro editions, the Harlequin editions are clearly not originals. 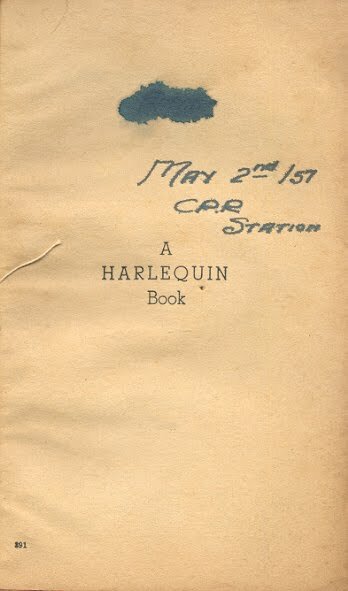 Perhaps Hanro and Harlequin acquired the rights to publish in the US and Canada respectively at the same time but Harlequin just took longer. 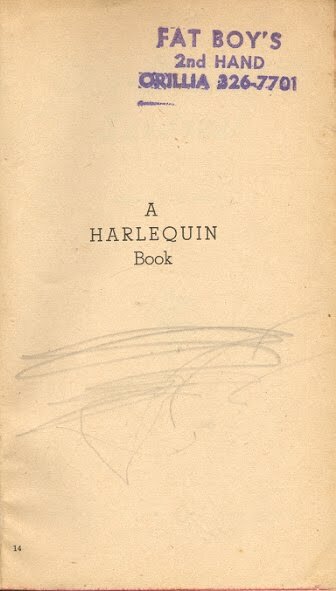 Harlequin then wasn't technically acquiring "reprint" rights. 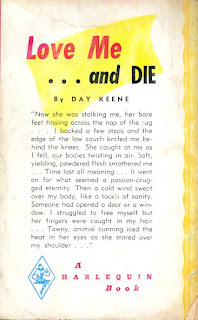 Day Keene is a pseudonym for Gunard Hjerstedt (1903 - 1969). 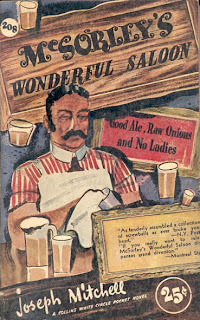 Keene became an actor in repertory theater in the early 1920’s. 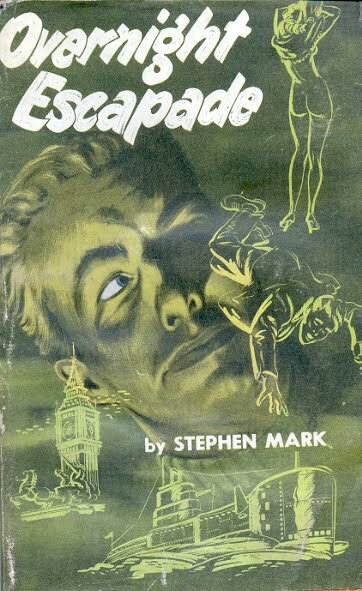 When his actor friends decided to try film, he instead turned to writing, and during the 1930’s was a principal writer for the “Little Orphan Annie” radio show, as well as contributing to the pulps. 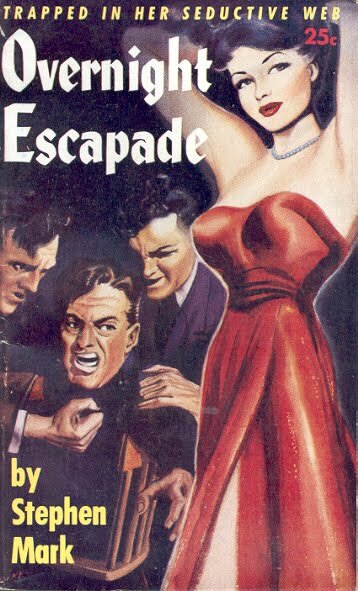 After he moved to the west coast of Florida, he began writing paperback originals in the late 1940’s, mostly fast-paced crime stories. 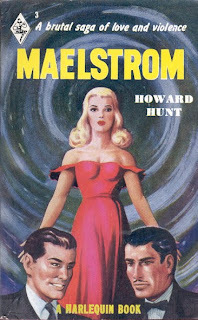 By the 1960’s, he had abandoned mysteries for mainstream novels. 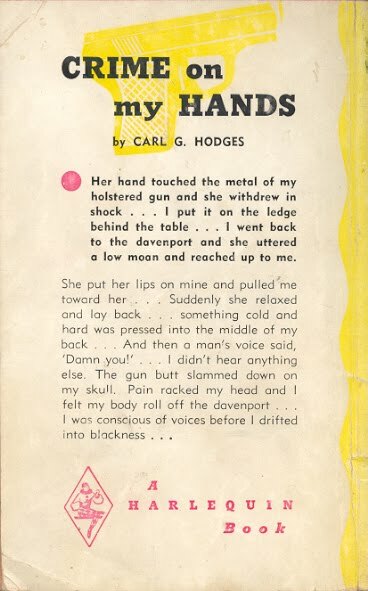 Carl Hodges (1902 - 1966) was a contemporary of Keene. Anyone who collects or reads old paperbacks sees the graffiti left behind by former owners. 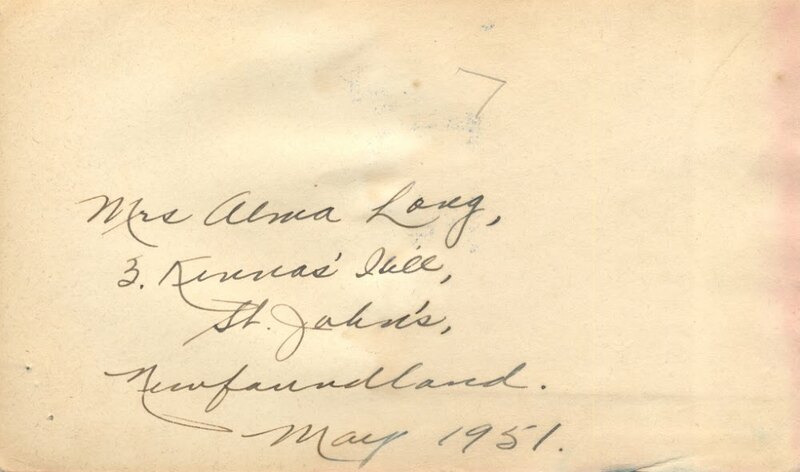 The least invasive is signatures, addresses and such of individuals. 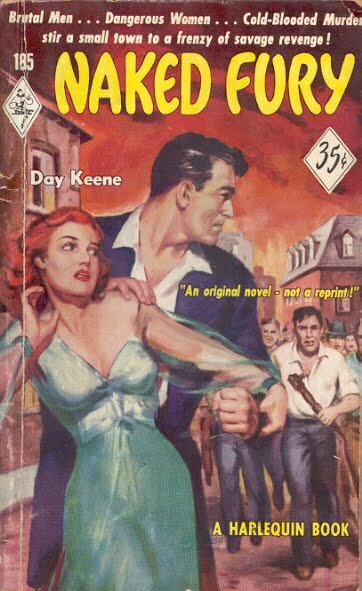 Booksellers leave the most invasive. 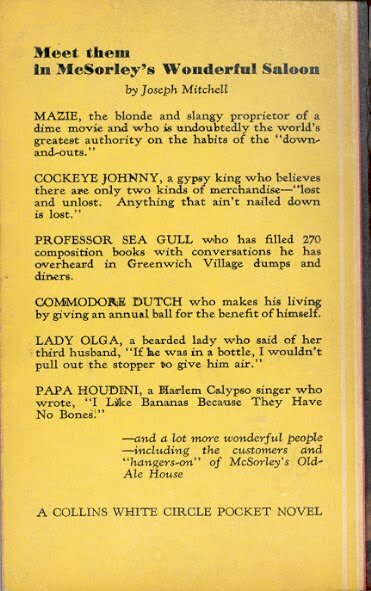 Here are some examples of the latter. The oldest is likely the first one. 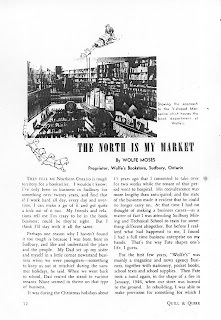 Wolfe's was in my old hometown of Sudbury and closed sometime in the 70s. 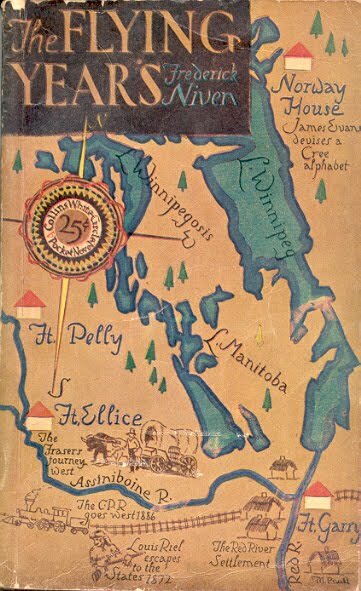 The closest match for the Book Market at 201A Pitt Street is Cornwall, Ontario. Nearly three quarters (186 of 258) of the authors Harlequin Books published between 1949 and 1959 were single title authors. Here are three, two crime/thriller and one historical. 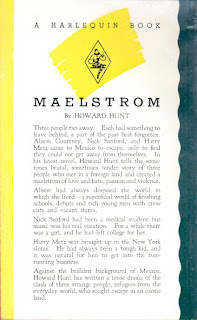 Maelstrom by Howard Hunt (1918 - 2007) was first published in 1948 (New York: Farrar, Straus). 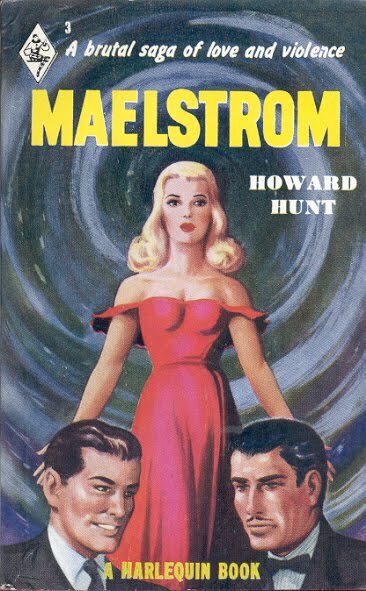 Better known as the convicted Watergate conspirator Maelstrom is Hunt's fourth of nearly 80 novels. 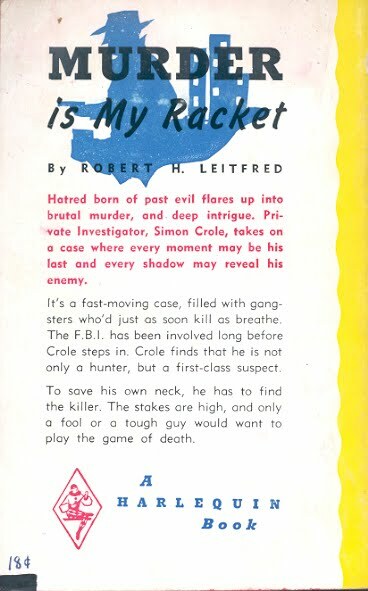 It was retitled as Cruel Is the Night (New York: Berkley, 1959). 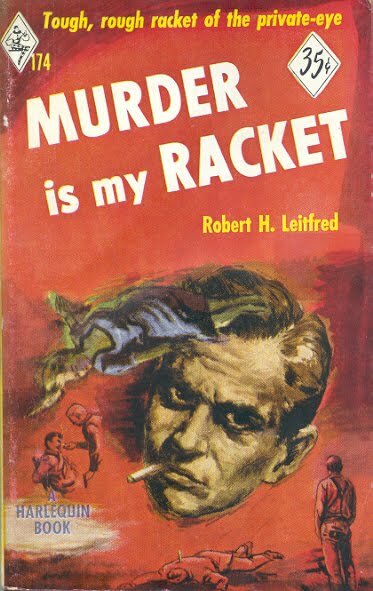 Robert H. Leitfred's Murder Is My Racket was first published as Death Cancels the Evidence (New York: Green Circle, 1938). 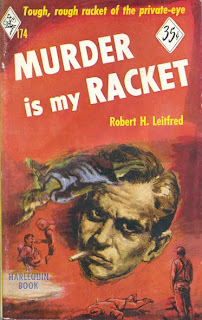 Leitfred wrote for the pulps in the 1920s and 1930s. 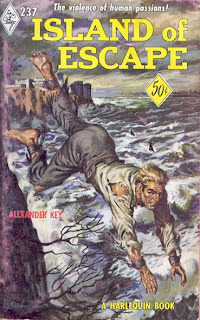 Alexander Key (1904 - 1979) is best known as the author of children's books (e.g. : Escape from Witch Mountain) and as an illustrator of books. His one book for Harlequin is Island of Escape (Indianapolis: Bobbs-Merrill, 1950 as Light Island). 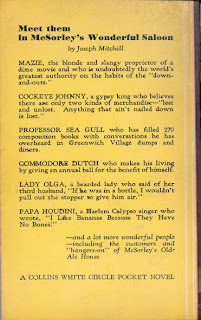 Part I provided definitions for each of the four terms used to bibliographically classify a book. 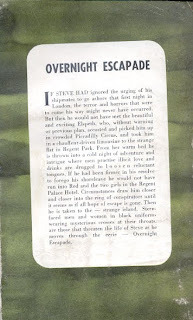 Here is the classification of an Export Publishing Enterprises Ltd book, Overnight Escapade and other stories by Stephen Mark. the sixth is NSL number 24A with a dust jacket. 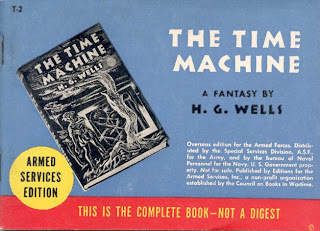 The front and back covers are identical except the third of the 24A variants which has black type on the back cover instead of the blue used on the other five. The second and third variants for 24A have dresses more orange than the red seen on the other four variants. 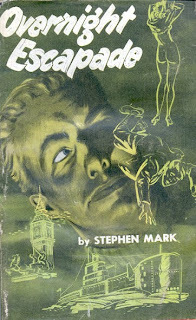 The spine on the 105 variants are identical. The 24A variants replace "105" with "24A" at the top and "MDS" with "KN" at the bottom. The variants for 24A are identical except the third replaces the blue with black ink. 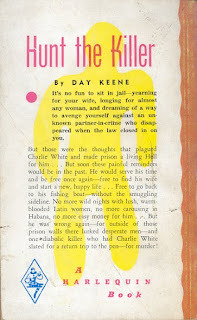 The title is orange/orange red in the 24A variants and red in the 105 variants. 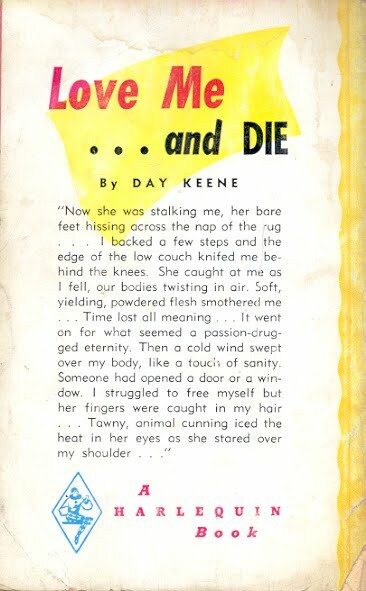 The inside covers have the same pattern but different colours. The 105 variants have slate blue and light blue. The 24A variants have light blue and blue. 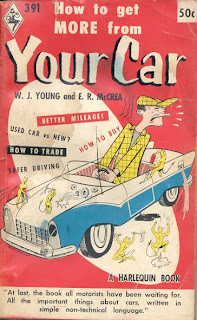 All variants have an April 1950 printing date. 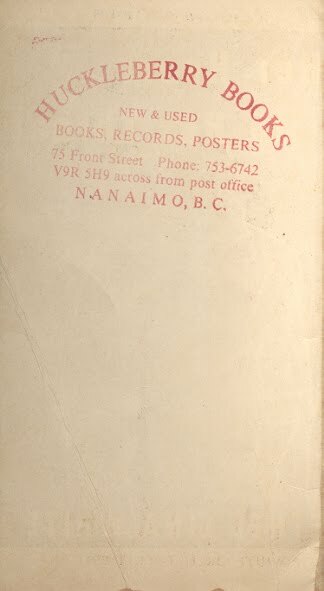 The 105 variants are identical except one variant has "COPYRIGHT 1950" missing from the copyright page. 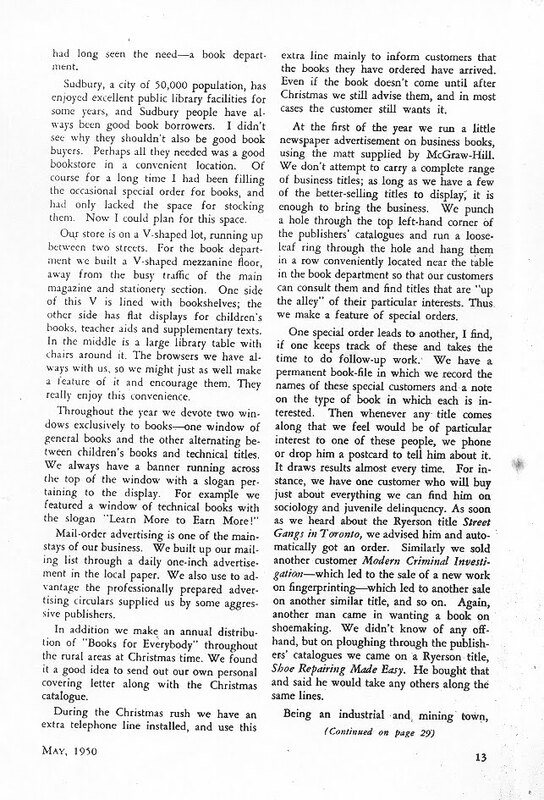 The 24A variants have different page collations from 105 with different page numbers missing. 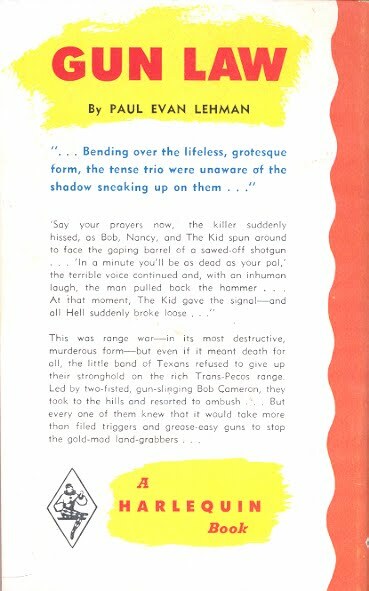 There are three different page collations within 24A. 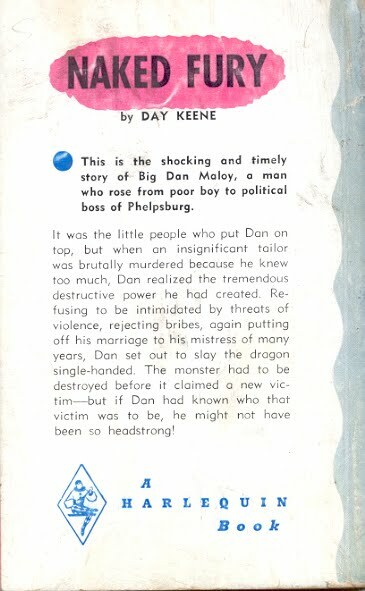 Otherwise the text is identical. So what do we have here. 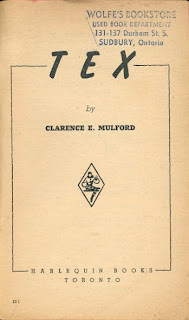 With the exception of the numbering differences the text block is identical. The conclusion is that the type was not reset so all six variants are the same edition. There is no publisher statement that any of the variants are different impressions as all have a April 1950 print date. In the absence of any evidence I conclude that all six variants are the same impression. 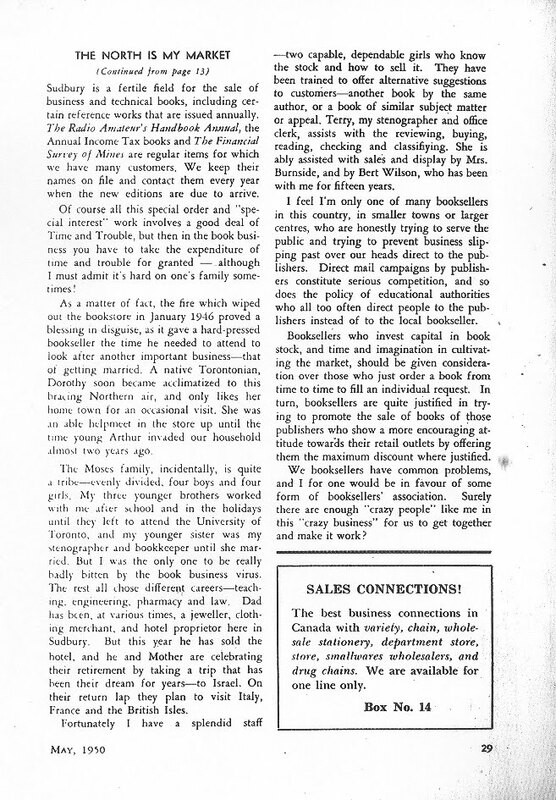 issue 3 - number 24A for sale in the US with a DJ. 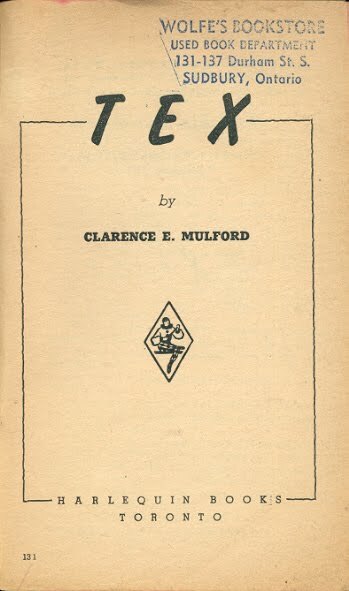 A state is defined as a "copy or group of copies of a printed sheet or a publisher's casing (i.e. 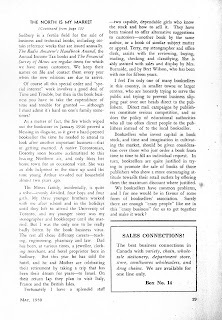 : covers) which differs from other copies of that sheet or casing in any respect which the publisher does not wish to call to the attention of the public as representing a discreet publishing effort." Usually states result from error or the correction of error. None of the remaining differences in the six variants create states. 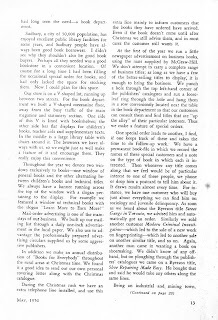 To sum up - one edition with one impression and three issues. 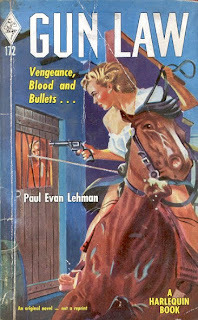 Part I introduced Harlequin reprints and showed one of the 20 titles that Harlequin published in more than one number in the series. Here's another one with an interesting twist. Gun Law by Paul Evan Lehman was first published in June 1952 as Harlequin 172. In February 1956 the title was reprinted as Harlequin 353. The text was not reset. 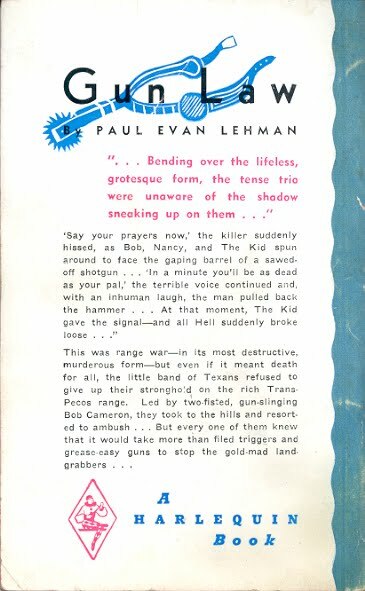 The back cover blurb is identical but has been reset. 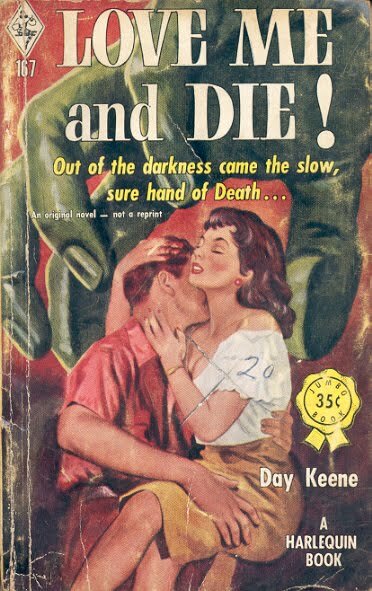 The cover artists are unknown. 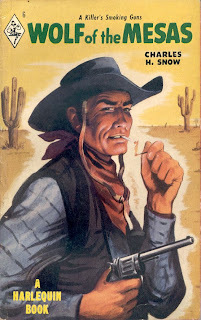 The added feature for this reprint is a recycling of a cover from a third title, Wolf of the Mesas, published in June 1949 as Harlequin 6. 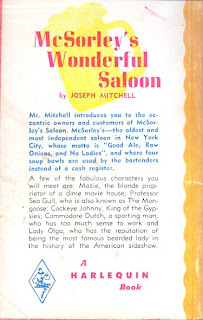 The first part of this series of posts introduced the first of five titles that were published both by Harlequin Books and Wm. 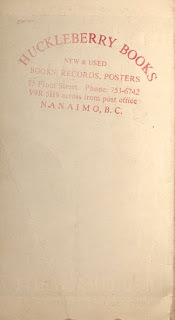 Collins Sons & Co. Canada Ltd in their White Circle line. 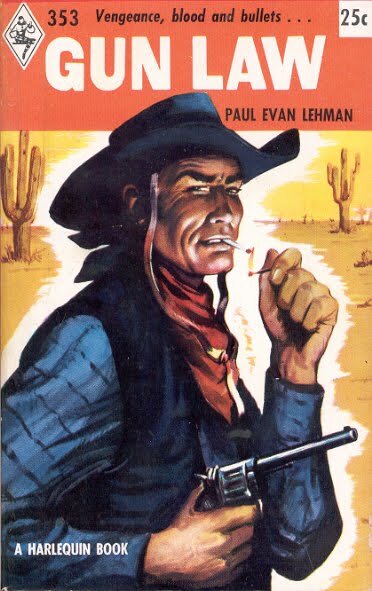 Here is the second and the best known of the five. 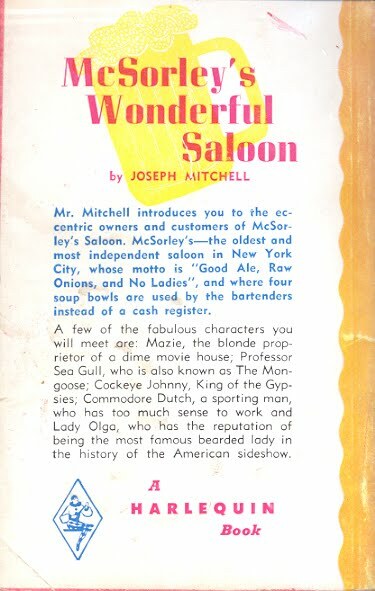 Joesph Mitchell's (1908-1996) McSorley's Wonderful Saloon was first published by Duell Sloan and Pearce (New York: 1943). The next year Wm. Collins published it as White Circle 208 and nine years later in July 1953 Harlequin 210 was published. 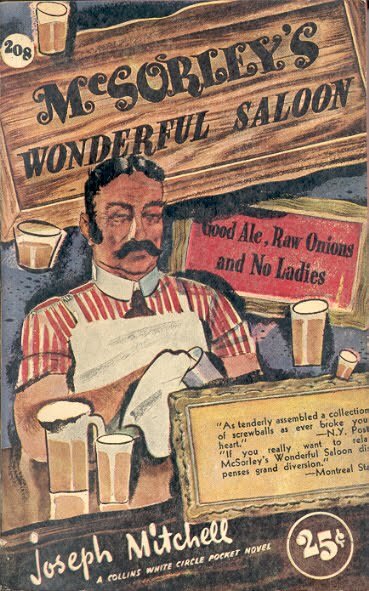 McSorley's is still around. 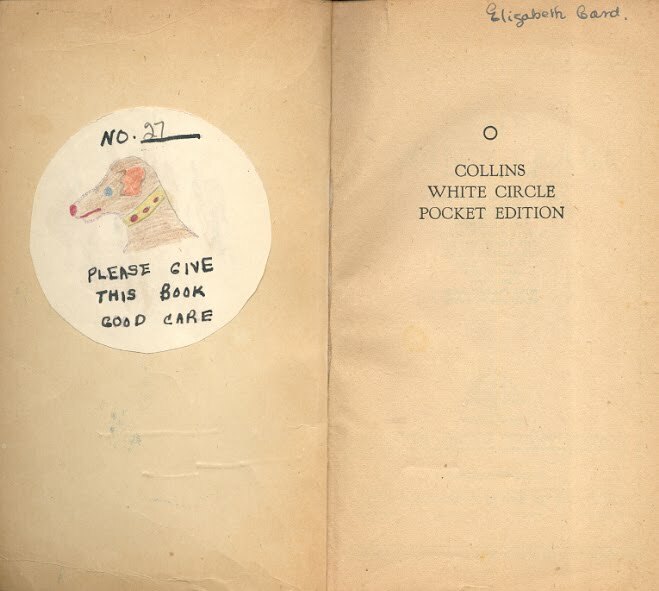 The White Circle edition comes in two variants - one with green edging and one with red edging - no priority. 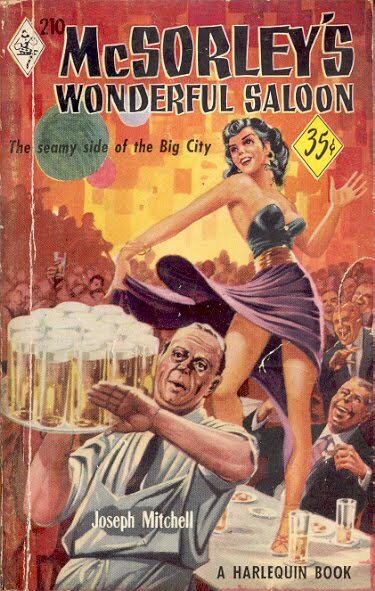 The cover artist is York Wilson. 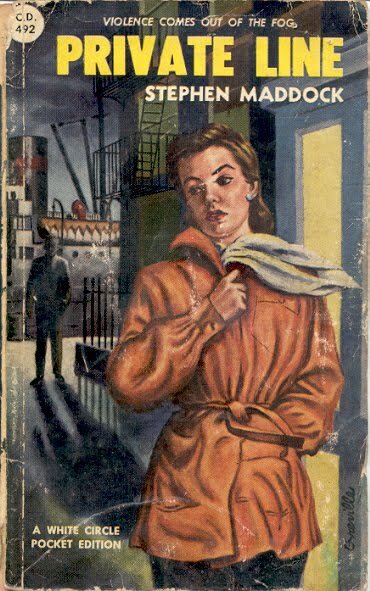 The Harlequin cover artist is Friede, about whom I know nothing. 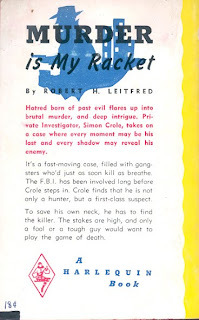 In the second post in this series I discussed one of the Crow books from Toronto's Alval Publishing. 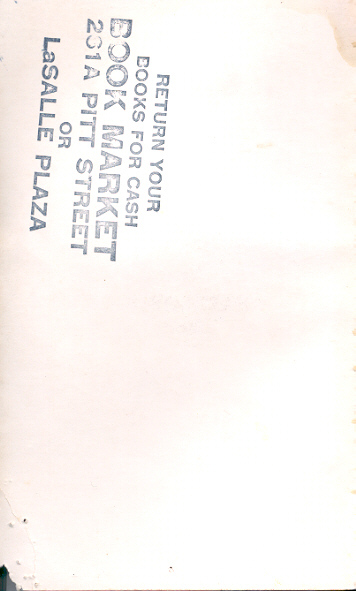 Here is another example of an abridgement effort from Alval. 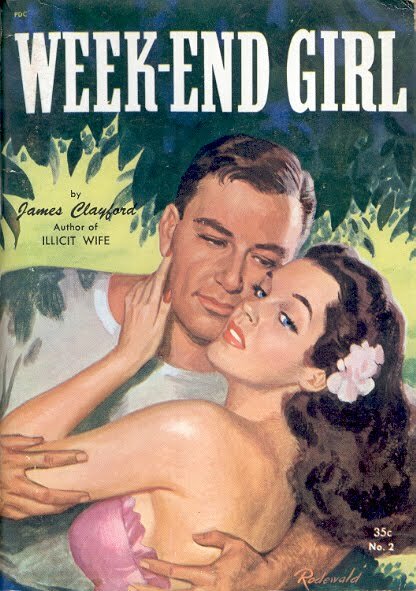 Week-end Girl by James Clayford (pseudonym of Peggy Gaddis) was first published as Lovers No More by Godwin (New York, 1934) as by Joan Sherman. 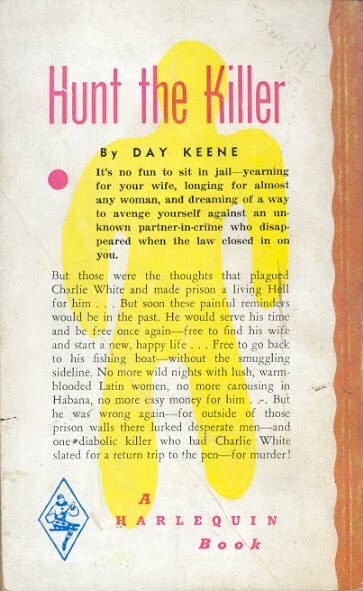 The new name and author were first seen in 1948 when published by Astro Publishing Corporation of New York as #2 in its two book digest reprint series. 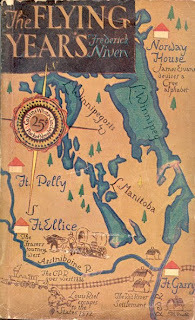 Next up was Alval's edition under the same names in July 1949 as Crow 26. 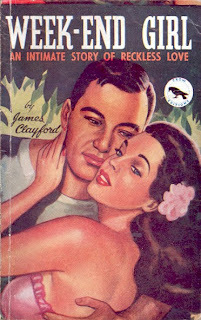 A final edition was published in 1950 under a new name, Beach Party, by New York's Star Guidance, Inc. as Venus Books 104. 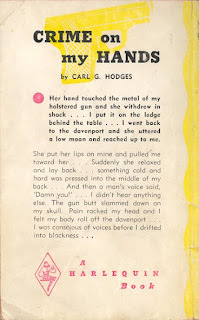 The author name was changed for a third time as well to Peggy Gaddis. 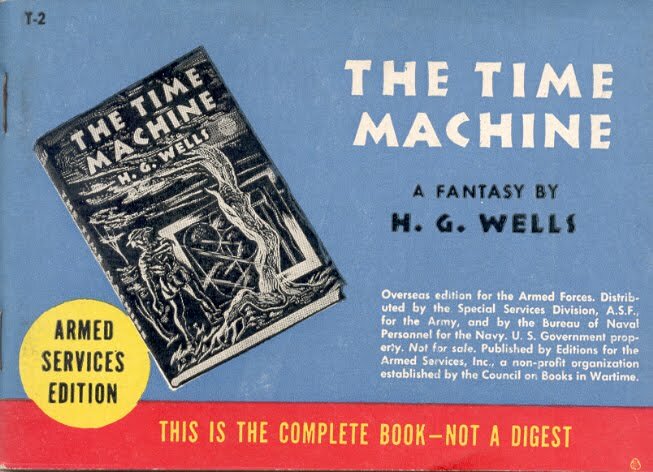 The Astro edition is described as "slightly revised" from the Godwin edition. 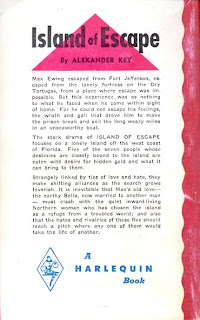 The Crow edition, based on information on the copyright page, uses the Astro edition. But it's not all there. 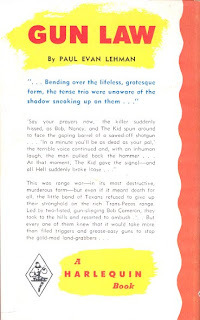 The Crow edition is approximately 30% shorter with chapters 15, 19 and 20 gone and other chapters cut. As usual no mention of the abridgement is made. One last interesting comparison is the cover. The Alval edition is a direct copy of the Astro edition (artist - Rodewald) by a less talented artist. 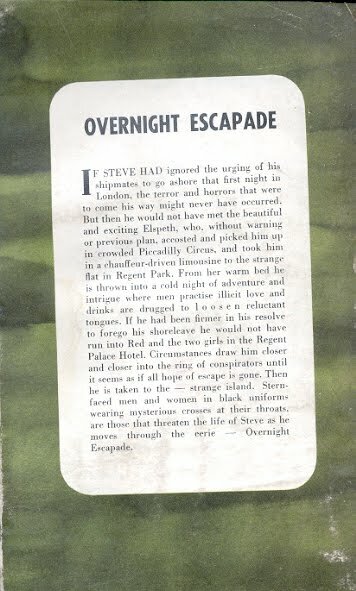 Here's an odd British paperback series from 1946. There is a Canadian connection, albeit tenuous. 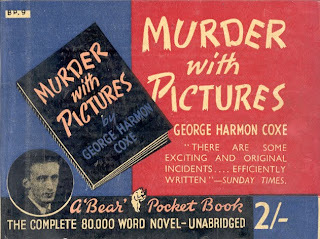 Bear Pocket was a series of nine books published by Bear, Hudson Ltd. of London. At first glance the books could be mistaken for the famous Armed Services Editions (ASE). They are the same distinctive vertical shape as an ASE, virtually the same size and are bound by staples with a glued on cover. 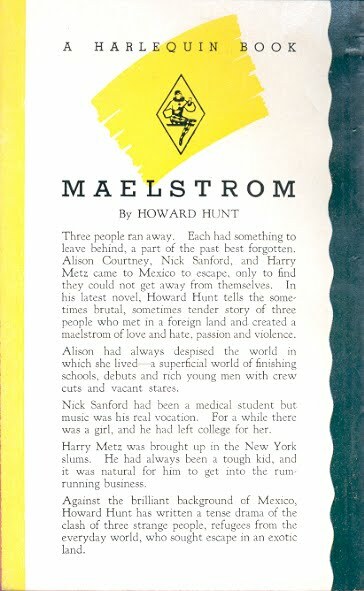 Like an ASE they are numbered in the upper left corner and the cover has a representation of a book’s cover on the left tilted to the left with the title of the paperback at the right. But there are differences. Instead of the words “ARMED SERVICES EDITION” in a circle in the bottom left there is a small circular photograph or drawing of the author. 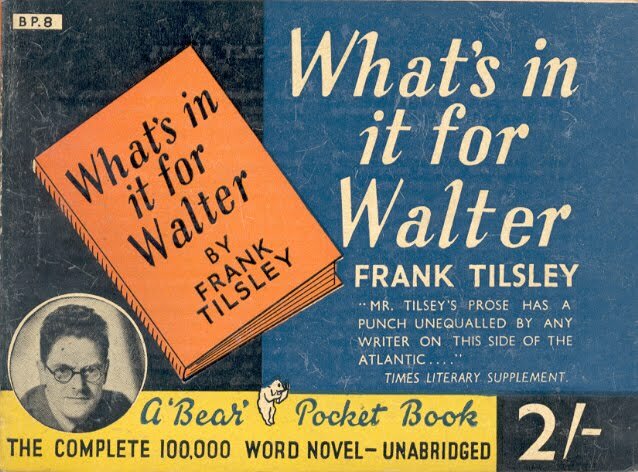 To the right of the author are the words “A ‘Bear’ Pocket Book” with a small drawing of a bear reading a book. Finally there is a price “2/-” at lower right. 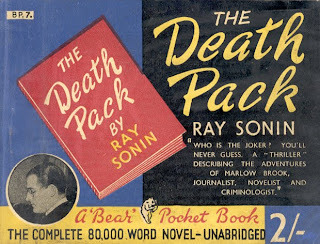 The Canadian connection is the author of the seventh book, The Death Pack. 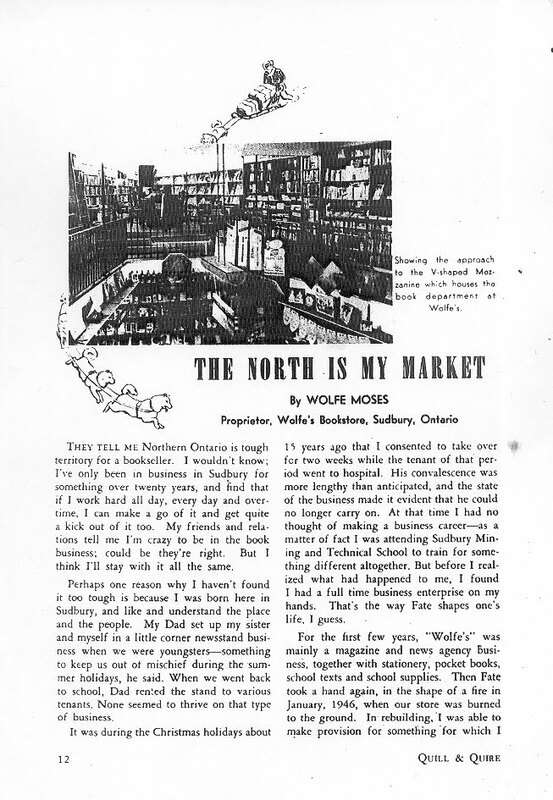 Ray Sonin worked in Canadian radio for many years. Here are the final three Bear Pockets plus an example of an Armed Services Edition. BP7 The Death Pack by Ray Sonin [1907-1991], (London: The Fenland Press, 1933). 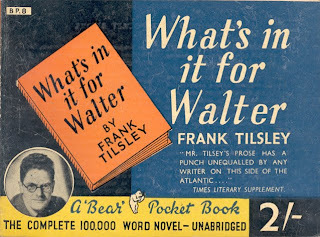 BP8 What’s in it for Walter by Frank Tilsley [1904-1957], (London: Collins, 1942). 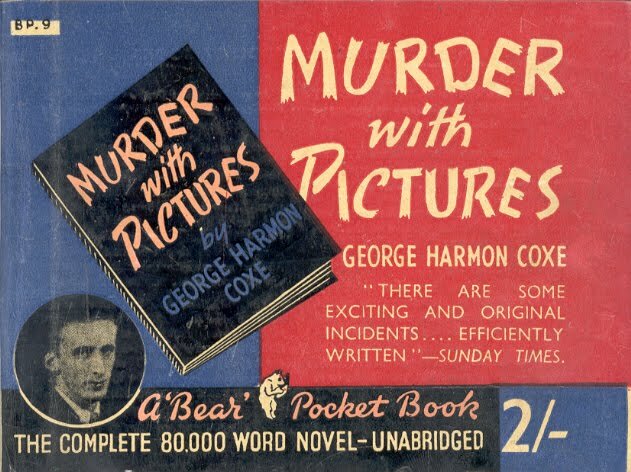 BP9 Murder with Pictures by George Harmon Coxe [1901-1984], (New York: Alfred A. Knopf, 1935).